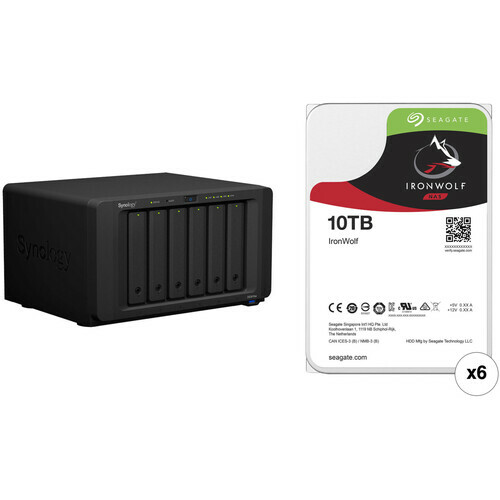 This B&H Kit combines the Synology DiskStation DS3018xs 6-Bay NAS Enclosure with six Seagate 10TB IronWolf 7200 rpm SATA III 3.5" NAS hard drives for a total storage capacity of 60TB. Built for work-intensive businesses and virtualization environments, the DiskStation DS3018xs 6-Bay NAS Enclosure from Synology is equipped with a PCIe 3.0 x8 slot that can accommodate a 10GbE network interface card for boosting network performance, or a dual M.2 SSD adapter card for caching. It is equipped with six drive bays that are capable of natively supporting 3.5" SATA hard drives, as well as 2.5" SATA hard drives and SSDs. Using its six drive bays, this NAS will allow you to store and share a large number of files, including videos, music, photos, and documents with up to 16,000 user accounts and 2000 maximum concurrent connections. The DS3018xs runs on Synology DiskStation Manager (DSM) OS, which is a browser-based operating system which helps to simplify managing your Synology NAS. Its CPU is a 2.2 GHz Intel Pentium D1508 Dual-Core with a burst frequency of up to 2.6 GHz, and its 8GB of DDR4 ECC RAM, which can be upgraded to 32GB, allows frequently-used files and applications to be quickly accessed. The NAS is capable of achieving read speeds of up to 2231 MB/s and sequential IOPS reads of up to 265,000. When connected to two DX1215 expansion units, up to 30 total drives are supported. Also featured are three USB 3.0 Type-A ports, which allow it to be connected to your Windows or Mac system, as well as two expansion ports. Network connectivity is achieved via four integrated Gigabit Ethernet ports, which support Link Aggregation and Failover, allowing your stored data to be shared with users throughout the network. Data may also be made remotely available through the free iOS and Android applications. For those who require RAID support, the DS3018xs supports a variety of modes, including RAID 0, 1, 5, 6, and 10, each of which offers performance, data redundancy, or a combination of both. For those who do not require a RAID, JBOD is also available, allowing each drive bay to be individually utilized. The DS3018xs is engineered to be energy efficient. Not only does it offer dual 92 x 92mm fans to help keep the system running cool at all times, its noise dampening design of 25.5 dB(A) makes for quiet operation. The server supports numerous scheduled power on / off cycles and hard drive hibernation to further minimize power consumption and operation expenses. The Synology DiskStation DS3018xs 6-Bay NAS Enclosure operates using a 250W power supply that runs using 100-240 VAC at 50/60 Hz. Included is an accessory pack, a power cord, and two RJ45 LAN cables. It is protected by a limited 5-year warranty. Powered by a 2.2 GHz Intel Pentium D1508 Dual-Core processor that can be boosted up to 2.6 GHz, an AES-NI hardware encryption engine, 8GB of DDR4 ECC RAM that can be upgraded to 32GB, read speeds of up to 2231 MB/s and sequential IOPS of 265,000, scalability that supports up to 30 drives with two DX1215 expansion units, Synology's DiskStation DS3018xs is a 6-bay NAS that comes with a PCIe slot and supports a 10GbE network interface card or a dual M.2 SSD adapter card. SSD cache support enhances network speeds and boosts performance, allowing the DS3018xs to meet data-intensive requirements. Equipped with dual-channel memory and a PCIe slot, the DS3018xs supports a dual M.2 SSD adapter card, M2D17, or a 10GbE NIC, for high-IOPS system cache and fast data transmissions, respectively. The M.2 SSD slot supports 2242, 2260, and 2280 form factors. The Btrfs file system introduces advanced storage technologies and optimized snapshots to help prevent data corruption and reduce maintenance overhead. While ensuring high-level data integrity, it also offers flexible, efficient data protection and recovery tools. Provides comprehensive quota control on all user accounts and shared folders. Provides schedulable and storage capacity-saving data protection with 1024 shared folder backups and 65,000 system-wide snapshots. Helps make data recovery fast and flexible. Helps detect and recover corrupted files without user intervention. Synology iSCSI storage fully supports most virtualization solutions to enhance work efficiency with an easy management interface. VMware vSphere 6 and VAAI integration help offload storage operations and optimize computation efficiency. Windows Offloaded Data Transfer (ODX) speeds up data transfer and migration rate. OpenStack Cinder support turns your Synology NAS into a block-based storage component. Analyzes system settings, password strength, network preferences, and removes possible malware. Encrypt shared folders and network data transmissions to help keep data from unauthorized access. Helps prevent others from logging into your DSM by generating a one-time password (OTP) on your mobile device. Customize the trust level in Package Center to avoid installing packages from untrusted sources, helping to safeguard your NAS from unknown on tampered package files. Synology's limited 5-year warranty provides hardware replacement and technical support via email and telephone services, helping to maximize your return on investment. A secure, reliable, and private mail server solution with an intuitive and modern mail client. Helps ensure seamless service transition between clustered servers in the event of a server failure. Number of Bays 6 x 2.5"/3.5"
Box Dimensions (LxWxH) 15.591 x 12.835 x 12.284"